Compared with England and the other great national monarchies, we face considerable difficulties in the reconstruction of the historical development of the Italian prison even with regard to its essential features. General material on Italy’s socio-economic development and studies on our specific theme are thin on the ground. The lack of a unified central power – both a cause and an effect of Italy’s historic backwardness – and the lack of a national monarchy which proved elsewhere to be of fundamental importance especially during the formative period of capitalism (the age of mercantilism) certainly present us with major problems. It is perhaps superfluous to add that this lack of unity failed to boost economic development in Italy thus preventing the generalisation of a whole series of experiences, ideas and measures such as prison. In Italy these experiences can only be seen as the heritage of individual states or regions. 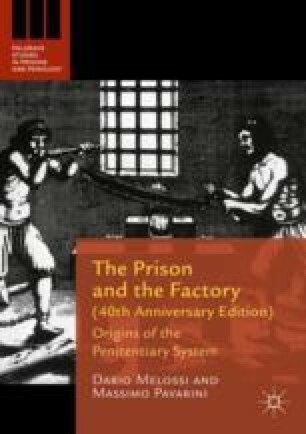 Thus it is arbitrary to consider Italy as a single entity, especially in relation to our subject, whereas in other countries, economic homogeneity and state intervention were the basis on which it was possible to develop initiatives in the sphere of prison.